Lound Infant School, Y1 Monkeys: Owls swoop in to school. 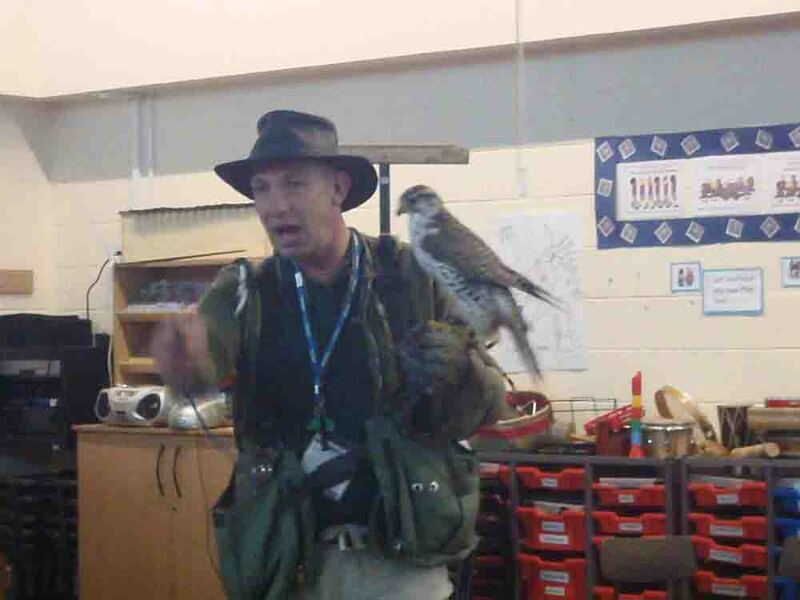 Today was the first day back after our half term break, and we began our new topic on 'night time' with a visit from a falconer called Andy. Andy brought in a barn owl, a European eagle owl, a falcon, and two Harris hawks. 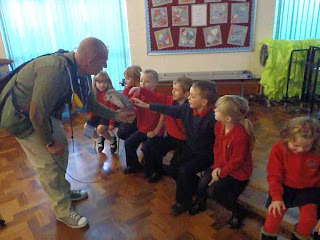 He told us lots of information about how the animals are nocturnal, where they live, what they eat, how they catch their prey and how the shape of the wings change from bird to bird. Andy with the European eagle owl. The falcon has pointy wings for flying at high speeds... faster than a formula 1 racing car! 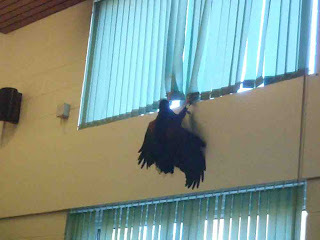 A Harris hawk tries to escape, you can see it's broad wings - these are good for gliding. 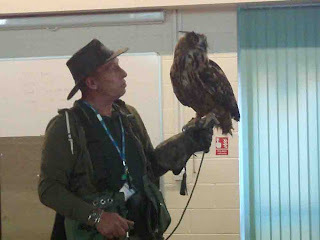 When we waved at the eagle owl he waved back! Molly the barn owl was really tame. We were all able to stroke her, and some of us had the chance to play falconer as she flew towards us and landed on our arm. In the afternoon we created a mind map about all the information we had found out, and then wrote some information cards using one of the facts that we found interesting. "The Harris hawk sleeps by wrapping his wings around his head"
Alfie asks 'Does it hurt when the owl lands on your arm?' He has two birds at home called Sky and Bertie and their claw hurt your arms. Lennon asks 'Do you have to wear a special kind of glove?' Poppy and Morgan really loved the birds. Lots of us want a turn at letting the owl sit on our arm. Some of us said we might be a little bit scared. "WOW, that looks really cool how the bird flew to the girl." Anna. "i want the bird to fly on my arm too" Zahir. We would love to know how it felt when the owl landed on her arm? Thank you for your questions. 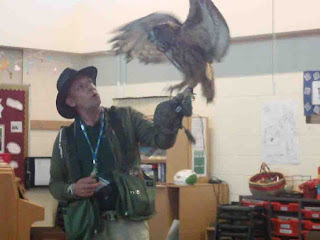 The owl was really heavy, and the food was a bit yucky on the glove. We had to wear a really thick glove so that the owls talens didn't hurt, but you could still feel them. It was a bit scary as the owl flew towards us.